Community Economic Development’s purpose is to revitalize communities, develop and rehabilitate affordable housing, promote sustainability, attract investments, build wealth, encourage entrepreneurship, and create jobs. 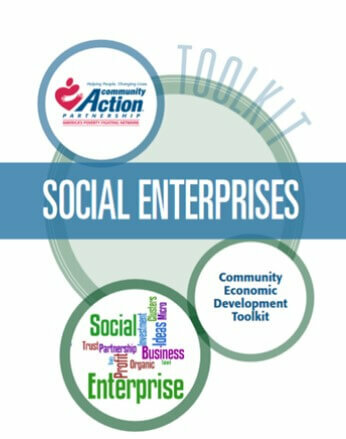 Community Economic Development identifies, disseminates and implements successful best practices for Community Action Agencies and related organizations. It provides strategies by which local development organizations initiate and generate their own solutions to their community’s economic problems and thereby build long term community capacity and foster the integration of economic, social and environmental objectives. Public programs may be used and corporate support attracted, but organizations representing the interests of the local community launch and direct the initiatives. Please see the CED Profile Book link on this web page for continually updated case studies that demonstrate successes by Community Action Agencies! 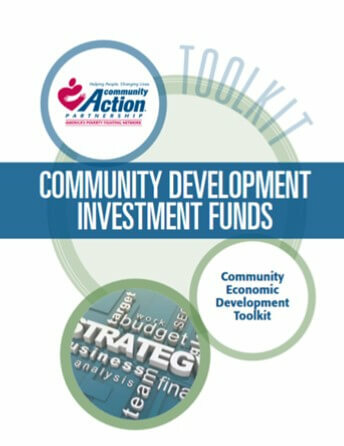 For more information and resources, you can also consult the CED toolkits listed below. Please also review our comprehensive CED Resources List. For links related to affordable housing, see the Affordable Housing Resource List. 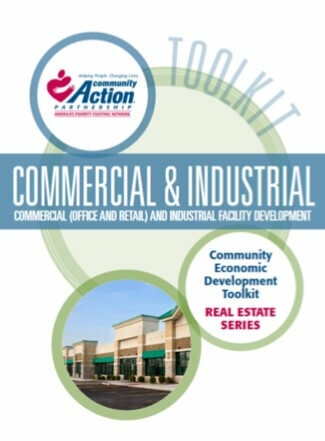 For links related to economic development, see the Economic Development Resource List. 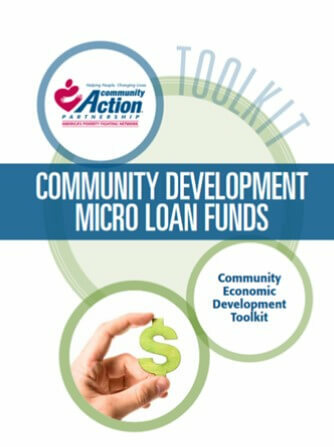 For more information on Community Economic Development and to learn how your Community Action Agencies can take advantage of the resources the Community Action Partnership provides, please contact Director of Community Economic Development, Kevin Kelly at kkelly@communityactionpartnership.com. You can also sign up to receive the monthly CED/CAFI e-newsletter here. 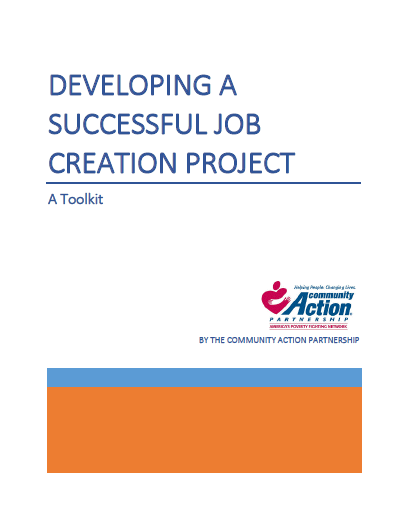 The Developing a Successful Job Creation Project Toolkit poses a series of discussion questions that will help your nonprofit organization think deeply about the elements required to design an economic development project that can successfully secure funding to create full-time, permanent jobs in low-income communities. 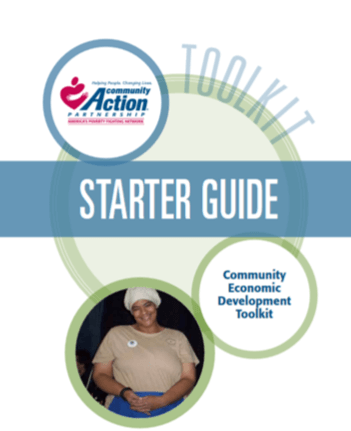 While Community Economic Development often refers to both housing and economic development projects, this toolkit focuses specifically on large-scale job creation projects. Examples of large-scale job creation projects include real estate development (retail, commercial, industrial projects) and business development (social enterprises and business lending programs). 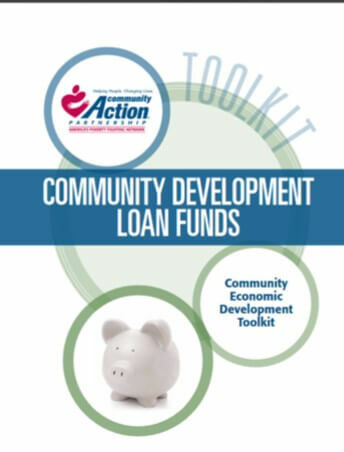 Community economic development (CED) is the process of addressing community economic problems – such as unemployment, lack of affordable housing, or the lack of sufficient retail and other services – through projects that are planned and implemented by institutions that are governed by boards with community involvement. The projects are designed to help address these community needs and also to retain the earnings in the community and to catalyze additional, future projects. Most often, CED projects fall into one of three categories: real estate, business development or financial services. The real estate category includes affordable housing, as well as retail, commercial, industrial, community service or mixed use projects. Their commonality is that they use land and buildings to create a community asset that helps fill a need. Many people equate “real estate” only with “affordable housing” projects – those projects that result in housing that is developed at prices affordable to lower-income people. And while nonprofit housing developers produce a great deal of affordable housing – one national study1 suggests that nonprofits produce about 100,000 units of housing annually, or a total of over 1.6 million units in the last dozen years – they also develop a significant amount of other real estate. That same national study indicates that nonprofits developed over 21-million square feet of commercial and industrial space in the years 2005 to 2008. The business development category includes creating small businesses, or providing assistance to entrepreneurs – through technical help, lending or investing – to form or expand their business. These businesses often provide a good or service in the community, and also offer employment opportunities for residents. Of course there can be overlap between this category and the real estate category – such as the creation of business incubators that provide space and assistance to small businesses within the community. Financial services is a diverse category. It can include providing loans and investments to various community projects, or to individuals (for such uses as home improvement or purchase). It can also include providing financially-oriented services to community residents, including financial literacy and asset building programs. CED work is accomplished through a variety of agencies and entities. For example, about 4,000 community development corporations (CDCs) work around the country, and have been active CED practitioners in their communities. 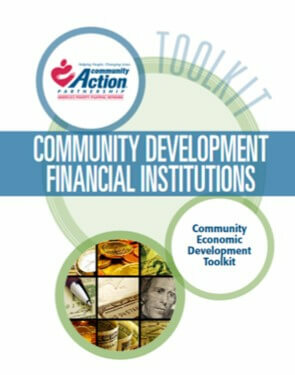 Community development financial institutions (CDFIs) have been active providers of CED-oriented financial services for a number of years – and have become more numerous and active over the last fifteen years with the help of the federal CDFI Fund. Independent social enterprises operate a variety of businesses in lower-income community settings. 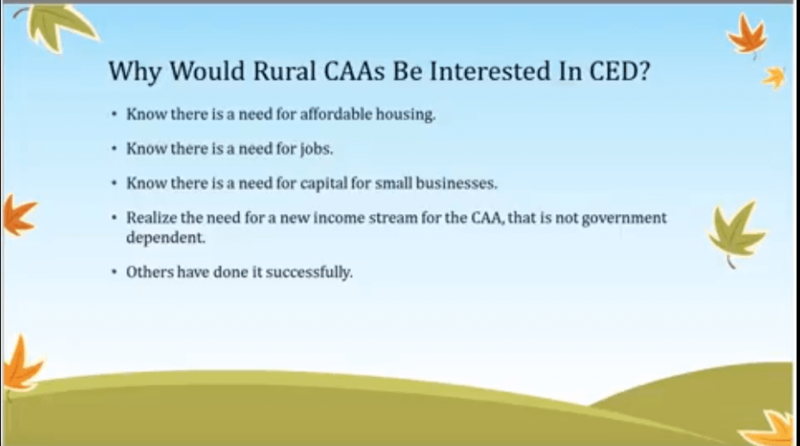 Increasingly, CAAs are active CED practitioners as well, often setting up subsidiaries to do the work. Their work is the focus of this site. What Makes an Organization Ready to Get Involved in CED? Looking across the hundreds of organizations that are successful in undertaking CED work, we can see several common characteristics. The organizations are able to understand and take on risk. One of the main things about CED is that its success is not guaranteed. It is possible that a project could be built and no one comes. Or project financing may take longer to come together than planned, leaving you at loose ends until it arrives. A lot could go wrong – but of course, so much could go right. And so the most successful CAAs that undertake CED understand the risks of the projects they undertake and insulate their core functions from that risk. They study the community conditions, needs, and opportunities. One of the best ways of understanding the risks of a project is to study the market in which your project will compete. That means understanding your organization and its skills, the community in which you work, including its assets and limitations, and the business and housing climate in which you work. Studying these factors will enable you to take the steps needed to lower the risk profile of your organization and project. You will understand what the competition is, where funding may come from, and what niches are available to help you succeed. They have the skills needed to accomplish the tasks. Whether you are building a business or building housing, your organization will need some specialized skills. These include the ability to find and negotiate with contractors, property owners, and funding sources; an understanding of diverse public and private funding streams and the demands of funders; construction supervision (if it is a building project), and financial management. Depending on the staff you currently have and on your resources, you may choose to partner with an experienced business or developer, or to contract for consulting help. The important point to recognize is that expensive projects are not the best place to learn on the job. They have connections to resources. Most likely – depending on the size of the project you are planning – you will need outside funding and approvals. (Remember: smart developers are building largely with other peoples’ money in order to minimize the risks they take.) So, it is important to have connections with people, agencies and institutions that can grant or loan you funds, and that can provide you the approvals you need. Of course – assuming you have successfully carried out programs for which you have built partnerships in the past – you have probably had the chance to build up a store of goodwill with the very people you may need to tap for these new funds and approvals. They have assets to use. The track record of success, and the networks you have created through your ongoing work are important assets you can use in the new project. But, depending on the project you are planning, it can also be important to have some of your own funds to invest in the deal. Some lenders, for example, may require you to have your own funds at risk in the project before they lend (to cushion them somewhat against loss if the project were to fail). Also, having some of your own money in a project gives you a bigger voice over what happens – as opposed to allowing the outside investors to choose a project’s direction. What type of CED project are you anticipating undertaking? Have you examined the market to make sure the project will meet a community need and succeed? Have you figured out what specialized skills may be needed for this project? Does your organization already have those skills on-hand? If not, have you determined how you will get those skills on your side? Have you spoken with the board about taking on risk for the organization? Have you thought of ways to mitigate the risks? Will you take on this project by yourself – or in partnership with a more experienced organization? Have you spoken with your existing partners and funders about your plans? One of the hallmarks of CED is that it has a “double bottom line.” That is, it makes sense financially and it benefits the community. Those community benefits can include new or retained jobs, affordable housing for lower-income people, new retail and other services to meet community needs, assets built for lower-income residents, and places to start and grow new businesses. There are a number of ways to assure you get the best benefits for your community’s lower-income people from the project you create. You can price the product – such as housing units you develop – for the low-income customer. But, this also often requires you to find enough money to subsidize the development in order to charge less rent (or lower sales prices). This can be done by finding a subsidy source (see the section of this website on housing to examine the various potential sources and how they work) or by raising sweat equity or making extensive use of donated land, buildings and materials (groups like Habitat for Humanity or Rebuilding Together have become expert at such work). You can make sure that some of the jobs in the new business or development go to people in need within the community. A number of businesses have been started to give jobs (or job training) for youth, homeless people, or people leaving the judicial system. These businesses – such as restaurant or food services, landscaping and office/home cleaning, and recycling businesses – often incorporate some form of job training for the new staff, some of it quite extensive, depending on the employees’ needs. For example, in Indianapolis, RecycleForce, is a social enterprise that employs formerly incarcerated individuals to help recycle computers, and other items like TVs and microwave ovens, that are no longer useful. The employees extract all parts and materials that can be resold, providing a “green” business model that helps pay a decent wage and provides job training and experience for the employees. RecycleForce has an extensive human service component that is paid for through the group’s connections with the courts and judicial system. Even when you don’t directly own or operate the business or development, you can help influence jobs and prices for the community. This can be accomplished by agreement with the partners you work with, or through agreements you sign with the businesses you lend to or invest in. These agreements can indicate a minimum percentage of jobs to be targeted for community residents, or what types of jobs that must be offered to residents. Who should benefit from the business or development you are planning? What steps are you preparing to undertake to make sure those benefits can be delivered? Will you track those benefits, or will you rely on others to track them? To make sure your organization is ready to embark on new community economic development work, you should consider the following six steps before you begin. None of these steps is hard – many groups have done this before – but all are important to assure that your organization can succeed. Take a look at CED and whether it is appropriate for your organization. The important thing to consider is whether your organization is prepared to embark on CED projects. Is there a good opportunity your organization can build on – such as having a solid base of capital and human assets to utilize – and skills, solid community standing, and opportunity – such as in the form of land to use for a new construction project, or a business model you can expand? Is your board in agreement with moving into new, uncharted areas? Are your funders okay with you expanding your work? In short, are you willing to take on the risk of expanding into a new arena? A small study group of staff and board can look at the pros and cons, and help make a recommendation. Be sure of what type of CED project you want to undertake. Once you have decided that CED is appropriate for your organization, then you can drill down on what type of project you want to undertake. Do you want to be a developer of affordable housing? Turn an existing office building you own into a community facility with rental office space? 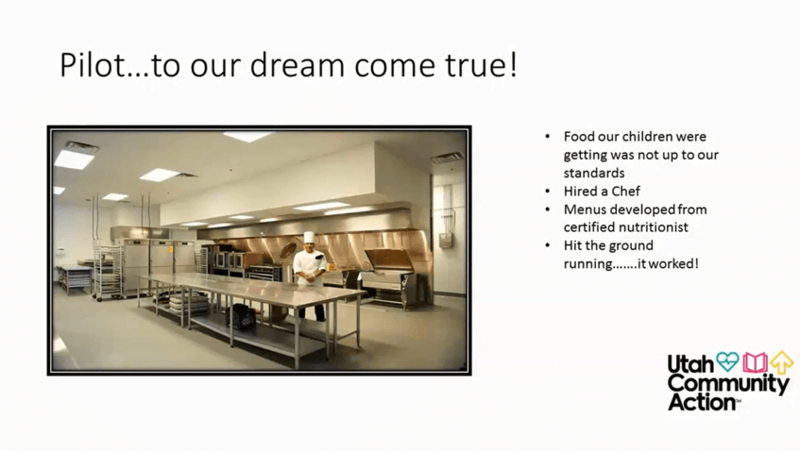 Expand your Head Start catering program into a broader catering business? Help employ youth in a landscaping business? Start up a loan fund to support small businesses in your community? There are so many opportunities, have you honed in on your top priority? And, importantly, have you selected a type of project that reflects your overall organizational mission, so that your CED work reinforces what you are doing every day, such as providing employment opportunities, serving the low-income community, or bringing new services and partners to your activities? Once you have decided on the type of project you want to start-up, then make sure you know the skills that are needed to succeed in that arena. If you are going to develop affordable housing, for example, you would do well to have financial packaging ability and construction supervision on hand. If you are going to start a small business line, employee supervision, ordering and management would be very useful skills. If you are going to start up a small business loan fund, then you will need staff capable of understanding loans, collateral and risk issues. Do you have them on staff? Do you need to hire people – and at what cost? Or might you have a partner with the right skills and eagerness to work with you? You also have to be certain that you understand the market you are entering. If you want to start a computer-parts recycling business, you will need to know how to understand where used machines are available and how to access them, as well as where and how to sell the material you will cull from them. If you want to turn excess office space in a building you own into productive and paying space, what other office space – of comparable quality – is available in your community, and at what rents. Same with housing: what properties already exist, and what is their vacancy rate, rental and sales prices, and who are the owners. Some lenders will require you to develop a full business plan, that describes the risks and your plans to mitigate them; however, to start off, an outline of a business plan may be enough for you. As indicated, understanding the market and its risks to you is important. But so too is learning how to mitigate the risks. This means that you would be wise to think of the ways to make project pivots if the initial plans don’t pan out. For example, if your office development cannot attract other social service agencies to it (your prime target for tenants), are there other businesses who you might attract at the same rent – businesses like small accounting offices, lawyers, small business start-ups, or public agencies? If your CED enterprise involves lending to small, start-up businesses, you should consider establishing a loan-loss reserve to compensate for slow- or non-payers. One example of making business pivots involves a landscaping and home-cleaning business. Initially, it was targeting customers among the numerous retired families in its community; but the national recession meant that these families were not able to spend as much for landscaping services, and so the business managers began – successfully – to get business from public and private small agencies and businesses. Finally, once you have reviewed what you are planning and where you stand on these issues, you should talk over the ideas with your board and closest funders and supporters. Their support will be important – especially when projects move slowly or barriers emerge. And so, make sure they understand what you plan to do, why, in what ways the CED work will enhance your organization, and how well you know the market and risks. Are you sure what types of CED projects you will undertake, what the costs and the financial returns will be? What are the three major market risks my project may face? The three major financial risks? What steps will we take to mitigate and reduce the risks cited above? Do I have the support of my board and major funders for this work? This guide examines the size of the check cashing/alternative financial services industry as well as estimates of the unbanked and underbanked populations in the U.S. by way of documenting the market size for alternative financial services. It also explores the various models being used by CDFIs and other nonprofits to provide check cashing and other alternative financial services to low-income families in responsible and sustainable ways. 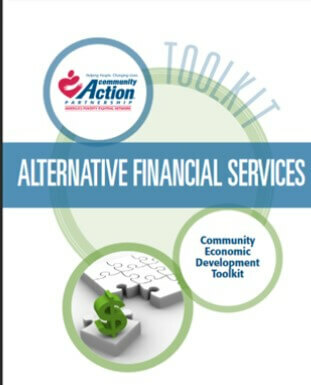 It then walks through the possibilities and considerations for a community development organization just beginning to explore engaging in providing alternative financial services as a new program or line of business. Provides background on CDFIs and what they do and explains what is needed to become certified as a CDFI by the U.S. Treasury Department’s CDFI Fund. Deals with the development of retail, office space and industrial space, including incubator space. This guide takes you through the key steps in the development process. To assist you, the publication has divided the development process into phases. The first phase can be accomplished with existing staff interested in community development. The second phase will detail what needs to occur to complete the development process. 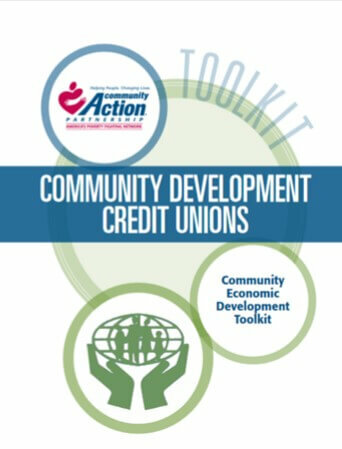 Designed both for organizations wishing to create a community development credit union as a local alternative financial institution and for those wanting to learn more about community development credit unions and how they operate. 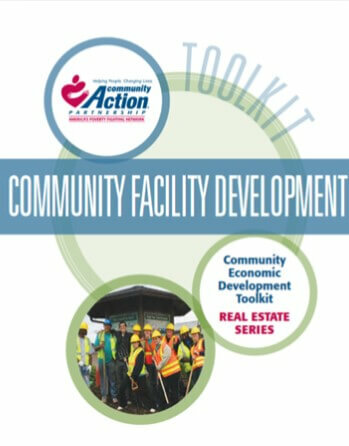 This guide is intended for use by community practitioners considering becoming developers of a community facility. 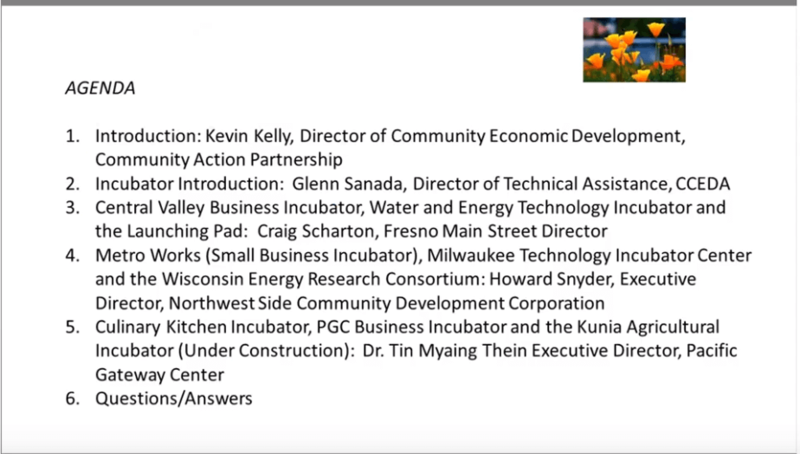 It will take the reader through the process, discuss how community facility development is different from commercial/industrial development, and discuss the New Markets Tax Credit program and how to use it. 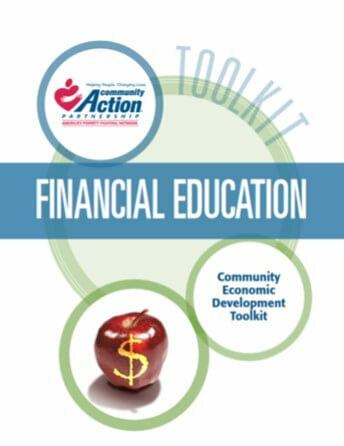 This guide is intended for use by organizations that are considering providing financial education services. Financial education programs encompass diverse topical areas, which can range from personal finance management to small business technical assistance. It can be provided as a stand-alone program or as a complement to housing or economic development projects. Discusses the details of setting up investment funds and the differences between investment funds and loan funds. This broad category includes all loan funds that are not Credit Unions or Equity Investment funds. The information in this toolkit includes the steps and considerations that should be taken before starting a loan fund. Microloans are a type of loan fund that focuses on smaller loans, primarily for start-up business financing. Microloan funds are a specific type of fund which targets small loans to entrepreneurs. Loan funds can specialize and focus on lending for various products and markets (business start-ups or expansion, particular business sectors or target markets) in specific neighborhoods or regions. 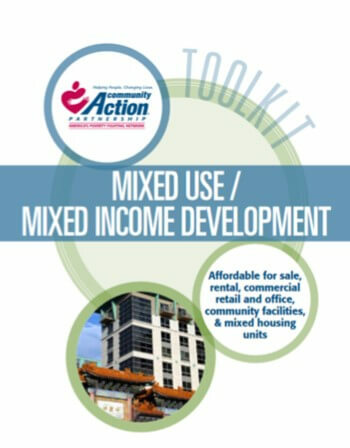 This guide is intended for use by community development practitioners considering development of mixed use and/or mixed income projects. Mixed use projects incorporate different real estate uses within one project. This mix may include affordable for sale or rental housing, commercial, retail and office, and community facilities (such as child care, health care or space for community use). Mixed income refers to properties that include housing units targeted for above moderate income buyers and tenants. Intended for groups interested in becoming developers of multi-unit affordable rental housing projects through the acquisition of existing multi-unit projects with minor to moderate rehabilitation needs. Designed to help organizations understand the complexities of the development process. Discusses Low Income Housing Tax Credits and also bond financing. This guide provides an overview of the program, how it can be used, how to apply for the credits, definitions and basic requirements. 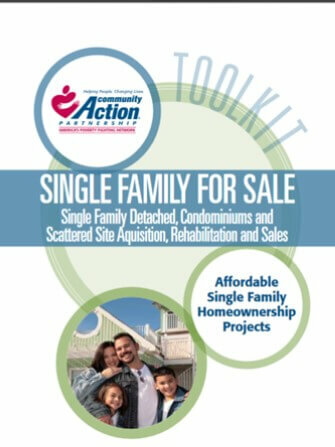 This guide is intended for use by community development practitioners interested in developing affordable single family homeownership projects. Projects may vary and include single family subdivisions, multi-unit condominiums and single family acquisition rehabilitation projects. 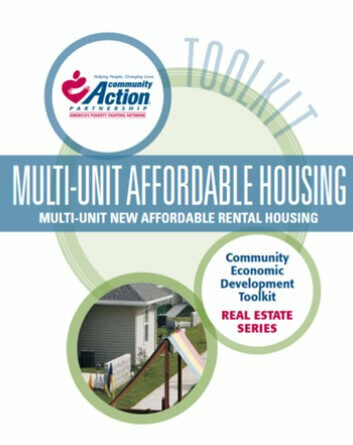 This guide is intended for use by community development practitioners considering becoming developers of multi-unit affordable rental housing projects. Multi-unit projects are built to serve specific populations including seniors, families, homeless, transitional and housing for mentally or physically disabled. This guide will help organizations understand the complexities of development and the commitment needed to proceed. 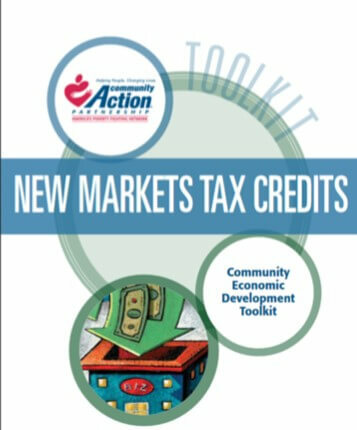 A discussion of how to use the New Market Tax Credit is included. This guide is intended for use by organizations that are considering providing small business technical assistance services. 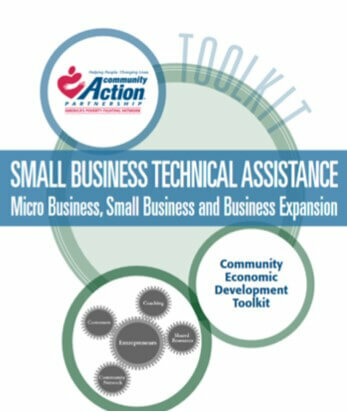 Small business technical assistance encompasses diverse topical areas that can serve a range of business sizes and needs. Business sizes include microbusinesses, start-ups, and small business expansion. Services can include assistance in areas such as marketing, management, finance and strategic planning. A growing number of Community Action Agencies and other not-for-profit organizations are seeking opportunities to start or expand ventures that fulfill their mission and provide earned revenue. A social enterprise is an organization or venture that accomplishes these dual objectives. By selling mission-related products or services, social enterprises apply market-based strategies to build a more just, sustainable world. The earned revenue strategies used by social enterprises help them to pursue a double or triple bottom line; double bottom line meaning the simultaneous creation of both a financial and social return on investment or in the case of triple bottom line financial, social and environmental returns. This guide helps the reader think through the process of deciding whether or not to initiate a CED project and if so, what type. It addresses what makes an organization ready to get involved in CED, what questions to ask yourself, what resources are needed, what you need to do to get ready to successfully take on a CED project. 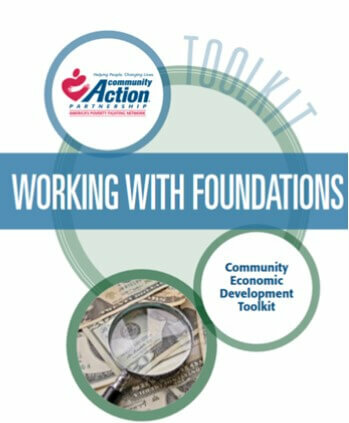 This guide describes the different types of foundations and the research, relationship building and other work that needs to go into a successful foundation fundraising strategy.